Genomic research of cultivated peanut has lagged behind other crop species because of the paucity of polymorphic DNA markers found in this crop. It is necessary to identify additional DNA markers for further genetic research in peanut. Microsatellite markers in cultivated peanut were developed using the SSR enrichment procedure. The results showed that the GA/CT repeat was the most frequently dispersed microsatellite in peanut. The primer pairs were designed for fifty-six different microsatellites, 19 of which showed a polymorphism among the genotypes studied. The average number of alleles per locus was 4.25, and up to 14 alleles were found at one locus. This suggests that microsatellite DNA markers produce a higher level of DNA polymorphism than other DNA markers in cultivated peanut. It is desirable to isolate and characterize more DNA markers in cultivated peanut for more productive genomic studies, such as genetic mapping, marker-assisted selection, and gene discovery. The development of microsatellite markers holds a promise for such studies. Microsatellites, also known as simple sequence repeats or SSRs, are a small array of tandemly arranged bases (one to six) spread throughout the genomes. Microsatellites as DNA markers are advantageous over many other markers as they are highly polymorphic, highly abundant, co-dominant inheritance, analytical simple and readily transferable . Microsatellites are reported to be more variable than RFLPs or RAPDs, and have been widely utilized in plant genomic studies [2–9]. The advantages of microsatellite over other types of genetic markers will become more important, and more obvious, when they are used to track desirable traits in large-scale breeding programs and as anchor points for map-based gene cloning strategies . There are a number of ways to obtain microsatellite markers. Screening genomic libraries by hybridizing with SSR probes and sequencing the hybridized positive clones is traditional but a laborious and costly approach. While screening the SSR-enriched, small-insert libraries can significantly reduce time and cost . Enrichment can be realized by hybridizing SSR-containing fragments with biotin-labeled probes that are either captured by magnetic beads coated with streptavidin or fixed on a nitrate filter . The eluted portion after removing non-hybridized DNA was highly enriched for microsatellites, with enrichment efficiency between 50–90% . Cultivated peanut or groundnut (Arachis hypogaea L.) is an important crop for oil and protein source. While China, USA and India are the biggest producers, it is grown throughout the world. Despite the existence of substantial diversity among cultivated peanut genotypes for various morphological, physiological and agronomic traits, very little DNA variations had been detected by using protein- or DNA-based markers [15–19]. Because of the lack of polymorphism at DNA level, this crop has lagged behind in genetic mapping, marker-assisted selection, resistance gene cloning, and crop evolutionary study compared with other crops. This problem has hindered the improvement of cultivated peanut by molecular techniques. Although microsatellites present in peanut [20, 21], microsatellites have not been fully identified, developed or utilized, and detailed information on the abundance of microsatellites still remains blank. The objectives of this study were: (1) to identify microsatellites from the cultivated peanut genome; and (2) to detect the polymorphisms using these novel microsatellites in a collection of peanut accessions with diversified origins. The microsatellite-enriched libraries were constructed using the enrichment procedure with some modification. Four hundred one colonies were randomly picked from primary transformation plates and sequenced. The length of most inserts was between 100 bp – 300 bp. About 247 (61%) of the colonies were found to contain SSR sequences, of which most were GA/CT repeats. Among these SSR-containing fragments, 83 were unique (33%) while the rest were redundant (67%). We could design primer pairs for 56 out of 83 unique fragments (see Additional File 1). The remaining sequences had too short flanking region to design primers. From 56 primer pairs, 19 could detect a polymorphism among 24 peanut genotypes (see Table 1). The average number of alleles per locus was 4.25 (see Table 2). Because the highest number of alleles was found using primer pair PM50, 24 more genotypes including one genotype from a wild species (A. monticola) were used to search more alleles at this particular locus. Up to 14 alleles were identified at PM50 locus when 48 genotypes were surveyed (see Figure 1). This is the first time that such a large number of alleles were identified in cultivated peanut. Using five such highly polymorphic markers, 24 cultivated genotypes could be differentiated (data not showed). We believe that microsatellite markers in peanut might be abundant like other legume species, such as soybean. These primary results suggest that this system is a promising one for isolation and characterization of microsatellites in peanut. Up to 14 alleles were identified at one locus using primer PM50. Lanes 1–14 are PI 476181, PI 497623, PI 536260, PI 501297, PI 540835, PI 502088, PI 475914, PI 476052, PI 493811, PI 468191, PI 576613, PI 494005, PI 494052, and PI 30063 (A. monticola), respectively. Lane M is molecular weight marker. The accessions used for detection of DNA polymorphism. * First number is forward primer Tm and second number is reverse primer Tm. Peanut is a unique species because very little genetic variation has been detected by molecular markers such as RFLPs, isozymes and RAPDs . Only a few molecular markers have been identified to link with resistance genes in peanut [25, 26] and thus genetic improvement through marker assisted breeding is limited. Although a considerable number of AFLP markers have been identified , substantially more DNA markers are needed to saturate the existing peanut linkage map and to initiate genetic studies for this plant species. Microsatellites have become one of the most widely used molecular markers for genetic studies in recent years. Enriching the AFLP or specific adaptor-amplified DNA fragments is a simple and efficient approach for SSR isolation and has been successfully applied to a number of plant genomes [12, 28–32]. By employing the modified procedures from other plant species, corresponding isolating protocols were established in peanut for development of microsatellites through this study. When the genomic DNA was converted into AFLP fragment assembly, the different set of AFLP fragments could be amplified using selective primers and then used for hybridizing with SSR probes. By optimizing the hybridization and washing steps, most of the AFLP fragments were found to harbor microsatellites after cloning and sequencing. In order to enrich SSR-containing fragments efficiently, several researchers [12, 28, 33] combined several SSR probes to hybridize with DNA fragments. However, some types of repeat were lost due to improper temperature during hybridization followed by washing . The probes were separately hybridized with fragments to prevent some probes from washing out in this study. However, the fragments containing GA/CT repeats were found most using three probes separately. A few GT/CA or AT/TA repeats were identified in some fragments. The results indicated that GA/CT repeats are the most abundant microsatellites in peanut genome. Compared to the previous report of Hopkins et al. on peanut microsatellites , in which five polymorphic markers from 26 primer pairs (19%) were identified using library screening method, our enrichment procedure was more efficient in identifying SSR markers, where 19 of 56 primer pairs (34%) showed a polymorphism. Although the percentage of detection of SSR markers based on total number of clones used was almost same, 4.1% (5/120 clones) from previous report and 4.7% (19/401 clones) from our results, the enrichment procedure is faster and less cost than library screening. The rate of redundancy was high in peanut, while it was very low in cotton . It decreased the efficacy of development of microsatellites in peanut. Therefore, a bigger library is needed to identify more microsatellite markers. Libraries could be constructed by hybridization of SSR probes with different set of AFLP fragments resulted from changing different one-base at 3' end of AFLP primers, which should have 16 possible primer combinations, or with different set of restriction fragments resulted from using different restriction enzyme combinations. No correlation was found in cultivated peanut between the number of repeat and the informativeness of the SSR, although a positive correlation has been reported for grapevine and tomato . The locus PM50 contains only nineteen GA motifs but is highly polymorphic. Other loci, e.g., PM244 [(GA)74], and PM209 [(GA)53] harbor much more uniform repeat units, but showed no DNA variations among diversified peanut genotypes studied. No polymorphism was detected with the repeat number over 30. With high-throughput technologies and facilities, such as robotic, imaging, and computational sequencing and genotyping facilities, more reliable polymorphic markers will be used to construct a high resolution genetic map and marker-assisted selection or even map-based cloning will be realized before long in cultivated peanut. The results provided by the present study highlight a simple and reliable way in obtaining polymorphic microsatellite markers from the cultivated peanut. A significance of the results is that development of microsatellite markers is important not only for peanut researchers but also for peanut industry as the paucity of DNA markers in cultivated peanut has so far precluded detailed genetic research on this crop. Peanut plant genomic DNA was extracted using MasterPure Plant Leaf DNA Purification kit (Epicentre, Madison, WI), and digested by two restriction enzymes (HindIII and MseI). Digested fragments were ligated with corresponding adapters and then amplified using one-base selective primers (HindIII-A and MseI-T) according to standard AFLP protocol . Three biotinylated SSR probes, (AT)15, (GT)15, (GA)15, which were reported being rich in other plant species, were separately hybridized with amplified AFLPs. Approximately 200 ng of the pre-amplified AFLP fragments (length range from 100 bp – 600 bp) were added to a single reaction mixture containing 4.2 × SSC (Saline-Sodium Citrate, pH 7.0), 0.07% SDS (sodium dodecyl sulfate), and 10 pmol biotinylated probe. The mix was incubated at 95°C for 5 minutes and chilled quickly on ice for 2 minutes. It was then kept at proper temperature (depending on the melting temperature of each probe) for one hour to perform annealing, for probe (GT)15 at 60°C, (AT)15 at 37°C, and (GA)15 at 57°C. Meanwhile, Dynabeads M-280 Streptavidin (10 μg/μl) was prepared by gently shaking the vial to obtain homogenous slurry. About 20 μl of the beads slurry was transferred to a 1.5 ml tube, then washed 4 times with 300 μl bead washing buffer (1 × TE + 100 mM NaCl). The beads were re-suspended with 50 μl of the same buffer, and added into the fragment-probe mix and incubated at room temperature for 30 minutes with constant gentle agitation. After immobilization, the supernatant was removed by applying a magnetic field to precipitate the beads, which attached the SSR containing fragments that hybridized to biotinylated probe. The bead-probe-fragment complex was washed three times each for 5 minutes with 400 μl non-stringency washing buffer (1 × TE + 1 M NaCl) at room temperature. The complex was further washed with 400 μl stringency buffer (0.2 × SSC + 0.1% SDS) for three times each for 5 minutes at room temperature. After the final wash, the washing buffer was completely removed, 40 μl of sterile water added, taped gently and incubated at 95°C for 5 minutes. 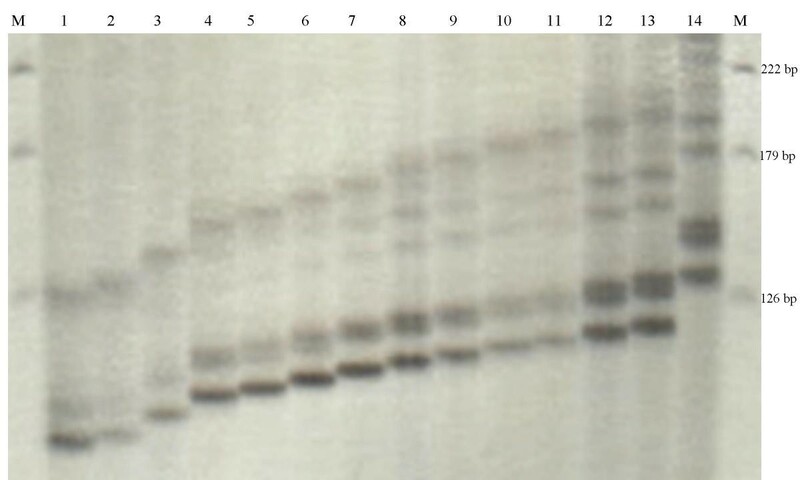 The eluted solution containing single strand, SSR-enriched fragments was cloned into the pCR4-TOPO vector, and the recombintants were transformed to TOP10 Chemically Competent E. coli following the instruction of TOPO TA Cloning kit (Invitrogen, San Diego, CA). Recombinant bacterial colonies were cultured for 14–16 h at 37°C. Plasmids were extracted and purified using Qiagen Qiaprep Spin Miniprep kit. Sequencing was carried out on an ABI PRISM® 377 sequencer using the Big Dye Terminator kit and Beckman Coulter CEQ800 using the CEQDTCS Quick Start kit according to the manufacturer's instructions. Primers were designed with the Primer3 software http://www-genome.wi.mit.edu/cgi-bin/primer/primer3_www.cgi and were synthesized by Sigma-Genosys. SSR primers were used to amplify the genomic DNAs extracted from a panel of 24 peanut accessions with diversified origins (see Table 1). The PCR programs for most primer pairs were as follows: 94°C/3 min for initial denaturation; 94°C/30 sec, 65 to 56°C/30 sec, 72°C/1 min, for two cycles at each annealing temperature; 94°C/15 sec, 55°C/30 sec, 72°C/1 min for 20 cycles; and 72°C/10 min final extension . For some primer pairs, such as PM36, PM 42, PM45, PM50, PM53, and PM60, the PCR conditions should be optimized to find suitable annealing temperature, such as 35 cycles of 94°C/30 sec, 60°C/1 min or 50°C/1 min, 72°C/1 min (see Table 2). The PCR products were separated on a 6% denaturing polyacrylamide gels for 3 hours at 250 voltages and visualized by silver staining. The authors thank Drs. Albert Abbott and Naveen Puppala for their useful comments on manuscript and encouragement. This is contribution No.326 from the George Washington Carver Agricultural Experiment Station. This research was supported by a grant from USDA/CSREES/CBG (No. 00-38814-9541). Mention of trade names or commercial products in this article is solely for the purpose of providing specific information and does not imply approval to the exclusion of other products that may be suitable. GH conceived and coordinated the project, participated in sequence analysis, primer design, and drafted the manuscript. RM and GG carried out the construction of SSR-enriched libraries, sequence of clones, and test of polymorphism with novel primers. MN performed sequencing clones. RP and CP involved in coordination and revised the manuscript. All authors read and approved the final manuscript.